Horses from down the road escaped and decided our yard might be nice. We woke up to a day with no new snow, nice for a change. Mo plowed the drive six times in the last 7 days. Melody and Axel have cars that aren’t exactly good on the steep and often slippery hill just outside the driveway on the short three mile drive to town. Once up and down the hill, all is good, but for simplicity I have Melody use our pickup to drive Axel to work. This morning, however, the road was blocked by 7 furry beings, all wandering around the driveway looking for something good to eat. Mattie thought the big critters in the yard looked really exciting. See that little ridge on her back. It is important to protect us from any possible evil, and she barked to be sure those horses knew they shouldn’t come in the house. The neighbor showed up fairly quickly as we were trying to decide what to do and blocked the road so they couldn’t escape. After some apples and some conversation, they put a rope on the lead horse while other trucks blocked the road so they could lead the small herd back home. All’s well that ends well. 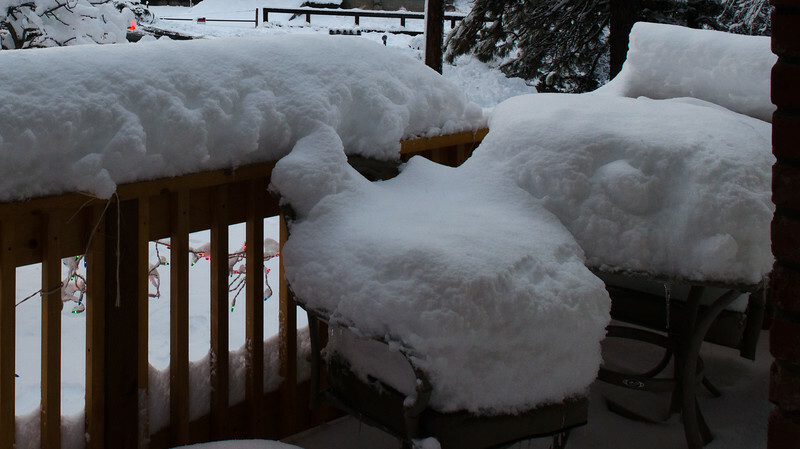 The snow has been here since Thanksgiving, and in the last week or so it just keeps getting deeper. Icicles provide entertainment as well, like corn on a hot summer day, you can almost hear them growing. Many days begin with Mo plowing and me shoveling before we come back inside and settle in for coffee and breakfast. For the first time in a very long time, our calendar is almost empty, with nothing really big showing up until we leave for Southern California mid-month. I am cleaning up the card making clutter upstairs, and today will get back to my quilting project. New Year’s Eve will be spent right here at home. Mo and I have even returned to cards and dominoes in the late afternoons before supper. After living life at an incredible pace for the past several months, even being a little bit bored is wonderful, and not the least bit boring! 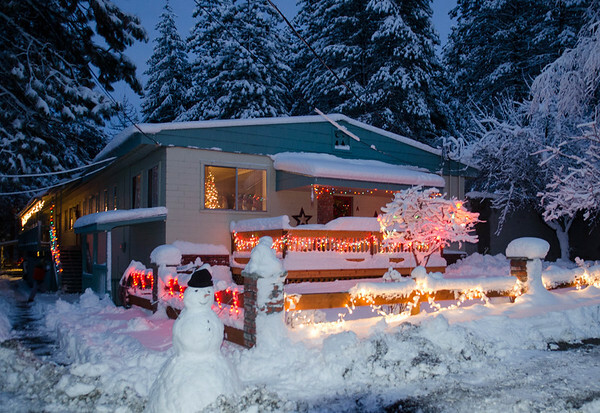 Christmas in the Klamath Basin with snow on the ground, highs in the 20’s, and lows in the single digits. May you all have a beautiful Christmas Day filled with the love of family and friends. Last fall, when lifetime friend Maryruth asked Mo and I if we would come to Maryruth’s mother’s birthday party, I felt a bit of hesitation. The party was scheduled for the 19th of December, way too close to Christmas. But it was Elsie’s 90th birthday, and the celebration was drawing friends and relatives from far and wide. I really couldn’t miss it. 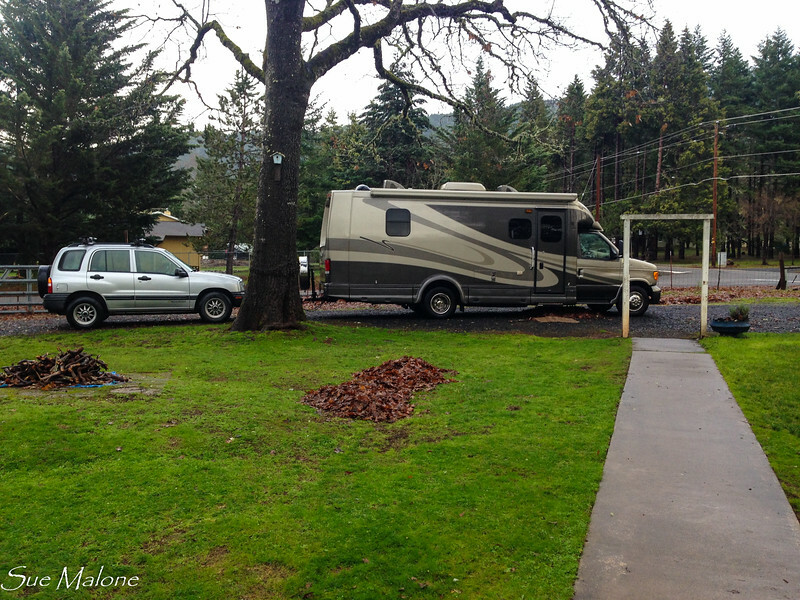 Of course, at this time of year, in this part of Oregon, there is no telling what kind of weather we might encounter, so we took our chances and decided to skip making reservations at the Feather Falls Casino KOA. 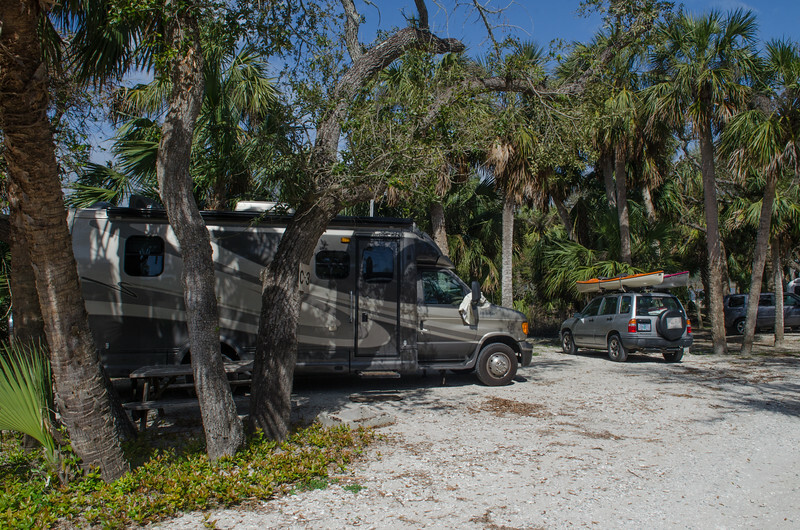 We like the campground, just minutes from Maryruth’s home, with all the amenities we could want. Somehow I wasn’t too worried about the park being filled up on the weekend before Christmas. We now are living in Klamath Falls, 45 minutes east of our former home in Rocky Point, adding that time and mileage to the trip over the mountain to Grants Pass to the west. The MoHo was waiting all cozy in her big shed, the baby Tracker is already over there, so we just needed to fit everything required for a couple of days in Rocky Point as we travel west, a couple of days in Grants Pass, to load up, do a few small chores, and get ready to go, and a couple of days in California. I can’t begin to explain how crazy making it is for me to try to think of food for each stop on the way, for clothes appropriate for the various weather conditions we will be encountering, and deciding just what I want to wear to the big Saturday night party. The truck was filled to the brim with sweats, jeans, some slinky dress up’s, way too many shoes, working clothes, snow boots and coats, lots of hats and gloves, and of course all the gear for the dog. Mattie is a bit like having a kid. We have her crate and bedding, her round bed for non sleeping comfort, another blankie since she gets cold so easily, and a bag of “doggie stuff”, which includes her shampoo, her favorite toys, treats, leash, a sweater, and a raincoat. As I read this, I am beginning to think we are really eccentric parents. That is a lot of stuff for a very small dog! When we arrived in Rocky Point, all was well. When I found out that the power was off for many hours, I was really glad that Mo and I had returned home to the apartments for a couple of days in between trips. This time the power was on and all was well. 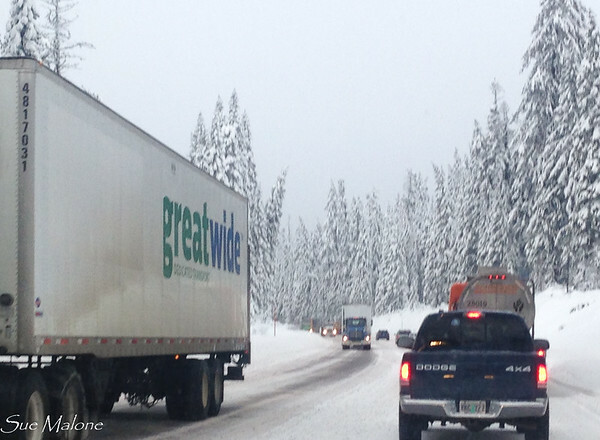 The next morning we headed for Grants Pass, driving over High Lakes Pass in some snowy conditions, but nothing unmanageable. The weather predictions were not encouraging, however. Winter weather warnings were going off every hour for extreme weather impacting most of Southern Oregon and especially the passes, including the route south on I-5 over the Siskiyous. We waited till Friday morning to make the actual decision, waking up to heavy pouring rain, and reports of temperatures above freezing at Siskiyou Summit. We hoped we could get over the mountain before the snow levels dropped. Neither of us have any desire to chain up the MoHo. Sure enough, the snow at the first summit was just flurries and the temps were above freezing, so no black ice. Whew. A nice long stretch to Weed and then once again the snow started blowing. As we passed the turnoff to Mt Shasta City and McCloud, we breathed a sigh of relief. That sigh was a bit premature I guess. It snowed all the way to the Pit River Bridge just north of Redding and much below the 3,000 foot elevation snow prediction. It was wet slushy snow, but not so much that it made driving impossible, and no chains were required. Thank goodness. Once past Redding, the snow turned to hard pourning rain, not much easier than snow for driving, and there wasn’t a bit of letup till we got to Oroville. Finally settled into our campsite at the only KOA we have ever really liked, we relaxed, knowing that we didn’t really have to think about the drive home for a couple of days. We could just relax and enjoy the party. Maryruth and her sisters held the party at a lovely small local winery in Oroville, Purple LIne Winery. The owners are good friends of another of Elsie’s daughters and were happy to share their lovely venue with the 100 or so guests who arrived on Saturday afternoon to celebrate. I have known Maryruth for 53 years, and of course have known her mother for that long as well. Elsie was a part of my extended family and I am so glad that Mo and I were able to be there to honor her. She was genuninely happy with all the attention, something that Maryruth had been a bit worried about. Today when I talked to Maryruth, she said the party was wonderful for her mom, that it elevated her mood and lifted the bit of depression she had been dealing with because of ongoing tiresome health issues. Elsie is a trooper, has always been a strong and incredible woman, and some of the issues of aging are extremely frustrating for her, as they would be for anyone. Mo and I managed to get a bit of time to enjoy the casino, which is really quite nice. I even won enough money to pay for breakfast the next morning and our wine at the party. We don’t play the slots all the often, but it seems lately that I have been pretty lucky when we do. Lucky as in tens of dollars, not thousands of dollars. LOL I never play big enough to win that big. After the casino Sunday Brunch with Maryruth and Gerald, we once again tackled the long drive home over the passes. By the time we left, the rains had started up once again and after getting gas in Chico for 2.15 per gallon at Costco, we drove 99 to the interstate and watched the road cams, the weather warning signs, and listened to 1610 AM radio for chain updates. The predictions were rather scary, and chains were required earlier in the day over the Siskiyous. We pressed on, hoping that the warm temperatures and rising elevation of the snows would stay with us till we reached Grants Pass. Again, the snow was wet and slushy, the chain requirement for the Siskiyou Summit was lifted just before we reached that point and by the time we landed in Grants Pass it was just raining. Neither one of us was really concerned about the drive from Grants Pass back home to Klamath Falls via Rocky Point. We have driven High Lakes Pass for dozens of years, and the Dakota has 4 wheel drive. We packed all our stuff back into the pickup once again, put the MoHo to bed, and headed back up the mountain. UhOh! That drive took us both by surprise! There was a LOT of snow on the side of the road from the previous storms, and yet yesterday the temperatures were rising. We had deep slush and ice on packed snow at the top of the pass, and neither of us could remember a transit as hairy as this one for a long time. In Rocky Point, the road that Mo usually plows, was unplowed. The neighbors who live farther up the road than we do don’t have a plow and evidently couldn’t get anyone out there. We drove up as far as we could and then walked through the deep snow to get to the house. Don’t laugh. I have three houses and two vacuum cleaners. I refuse to buy a third vacuum, and I had taken the main vacuum from Old Fort Road to Rocky Point. I needed that vacuum. I refuse to live through Christmas at home without a vacuum! Ha! 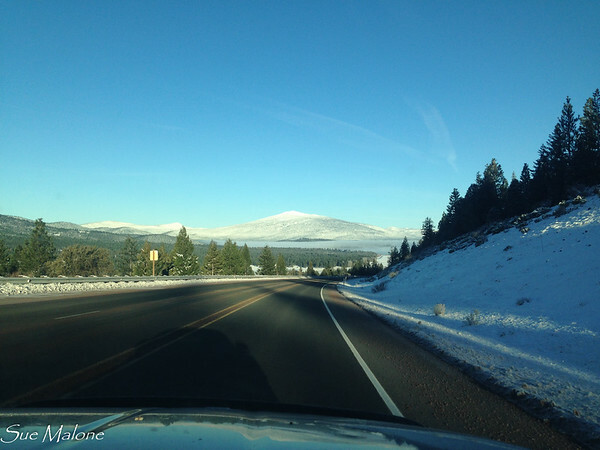 Back on the road to Klamath Falls, the snows were deeper than we have seen in years. And that snow just keeps coming. Sometimes it gets a bit warmer and rains on the snow, and then it dumps some more of the white stuff. Mo has a lot less to plow here at the apartments, but this thick wet stuff is keeping her busy. I am glad to be home, glad to have a few days at least to make cookies and fudge, get ready for Christmas dinner with the family members that are close, and play in my craft apartment making cards. Christmas will come so quickly, and it seems that we didn’t have a lot of time to do some of the small town Christmas things that I like to do, but with the really yukky weather, I really have no desire to brave the storms to try to go look at Christmas lights. I think I’ll just enjoy my own. The Soltice has come, the days are getting longer, Christmas is here!! At the moment, Mo is outside washing the MoHo. Yes, washing it in the rain. I am pretty sure she is thinking that she needed to get the salty residues removed that are left over from our last trip to the coast. It was raining back then as well, and we put her away without our usual cleanup. After 9 years on the road, the MoHo still looks shiny as new. Good paint and good care make a difference. 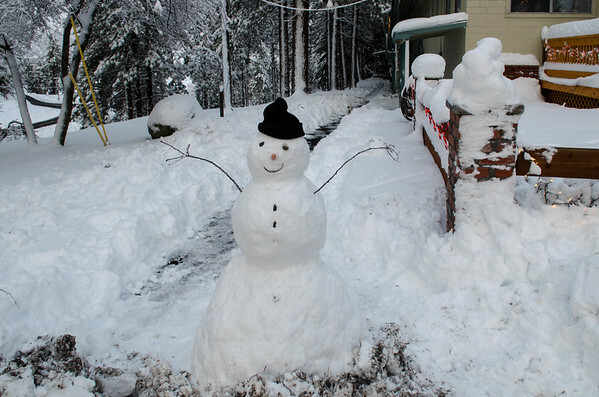 More than a week ago, the snows hit hard all over Southern Oregon, even here in the Rogue Valley. When we arrived at the cottage yesterday, our neighbor told us that there was more than six inches of heavy wet snow dumped on Grants Pass, and he was without power for 48 hours after a big old oak fell on his power lines. We were lucky. Mo had the trees trimmed last month and we didn’t have a lot of debris down to contend with. According to the neighbor, he watched our Christmas lights go on and off with the timer with considerable envy. Everything here was just fine and the house was nice and cozy since we left the gas heat on 55 degrees. Just enough. Since the first snow fell at the apartments, we enjoyed home time, cozied up with the fire and actually relaxing a bit. I worked on homemade Christmas cards with daughter Melody up in Apartment B (my crafting and quilting apartment) and managed to get a decent number of Christmas lights up to make everything cheery. Mo taught Jacob (one of the tenants rooming with grandchild Axel) how to run the plow, so that when we are away, the driveway and parking lot will stay clear. It was a very cold week, and quite delightful. We decided to return to Rocky Point to spend a few days working on painting touchups and other little chores before our planned quickie trip to California. While we were there, the big snows hit, including the one that dumped on the Rogue Valley, and Mo and I shoveled the driveway by hand. With the plow at the apartments, we relied on the 4 wheel drive in the pickup to get us up and down the road leading to our house. It worked. We didn’t get snowed in, and even managed to get the trailer hooked up for the trip to Grants Pass to pick up the motorhome. Mo wanted her big compressor in the RV shed with the MoHo. Gotta keep those tires up! Driving from the brilliant sunny skies of the east side of the Cascades to the gray, rainy skies of the Rogue Valley was a treat. For the first time in a few years, crossing the High Lakes Pass was a bit of a challenge. Not too much, just a bit. Seems as though the wet, heavy snows were too much for the big trees on the pass and one had fallen across the road. Traffic backed up for awhile before some logger with a chain saw managed to clear the road. Tomorrow we are heading to California. Friend Maryruth’s mother is celebrating her 90th birthday and Maryruth is putting on a very big party. The MoHo is ready and waiting, and we are hoping that the weather continues to be only rain as we will be traveling south on I-5 over the Siskiyous in the morning. We do NOT want to chain up the MoHo, in fact the main reason we bought property in Grants Pass was to be able to travel north or south in the wintertime without having to get out of the snowy Klamath Basin. Of course it snows in this part of Oregon, but thank goodness, not nearly as often or as long, and hopefully not tomorrow. My favorite pool at Catalina Spa and RV Resort. 95 Degrees F of heaven 24 hours a day. What a treat?! If I hadn’t already made reservations for Catalina State Park near Tucson I would have reserved more than the 4 nights we had time for on this round. I love that pool. Love it. I am excited about three weeks in the south this winter and hoping that El Nino doesn’t send us any big southwest surprises, but we will be ready for whatever comes. 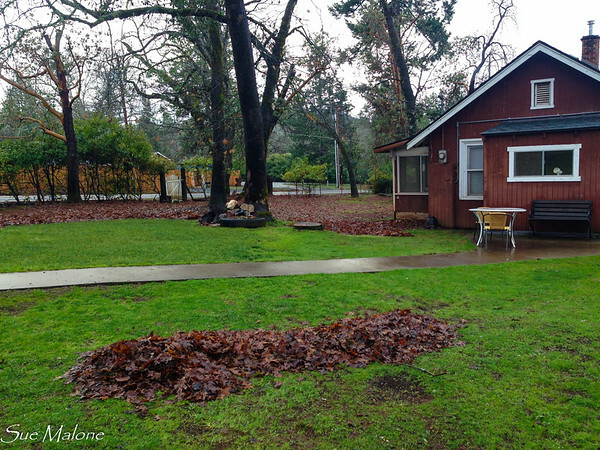 Today I raked leaves on green grass in the rain. A far cry from shoveling snow in Rocky Point and Klamath Falls. This was a great plan when I started this day, and now it is after 5pm and I am nowhere near finished. I am working on my laptop, the one I use for traveling. I upgraded it to Windows 10 Pro, and decided to just wipe the thing clean and start fresh. So far so good, but as I am beginning the blog, I realize that I have yet to install Lightroom and Picasa. That done I start again, but ohoh…some of the photos are on my iphone and ipad…and what do you know, I haven’t downloaded and installed iTunes yet. Ok…that done and now I can finally get around to finishing this post! Like so many lovers of LiveWriter, I am reduced to using the blogger platform for the time being. I have no clue how to make it "pretty". Frustrating, since pretty is one of the reasons I like to blog. Erin taught me how to use the HTML thing from LiveWriter, but oh what a slow process, at least for me. I thought I would try WordPress. Just a start, and I have no clue how to notify my followers and readers of the move, but here it is. Comments would be greatly appreciated. Is it tolerable? For me it is extremely frustrating that I cannot seem to change my background or text colors without paying 99 bucks a year, just for a theme I enjoy looking at. I imported from blogger, so everything is there, at least I think so. There is a very strange widget thingy in the upper left corner that I cannot seem to find to get rid of or edit, probably part of the fancy theme I am using, who knows. It is Greek to me so far. And here is an update. Now the comments don't go with the blog. But they are still on the old one here, so I probably won't take it down even if I use Wordpress in the future.